Death or injury to whales from vessel strike is one of the primary threats to whale populations worldwide. However, quantifying the rate of occurrence of these collisions is difficult because many incidents are not detected (particularly from large vessels) and therefore go unreported. Furthermore, varying reporting biases occur related to species identification, spatial coverage of reports and type of vessels involved. The International Whaling Commission (IWC) has compiled a database of the worldwide occurrence of vessel strikes to cetaceans, within which Australia constitutes ~7% (35 reports) of the reported worldwide (~471 reports) vessel strike records involving large whales. Worldwide records consist largely of modern reports within the last two decades and historical evaluation of ship strike reports has mainly focused on the Northern Hemisphere. To address this we conducted a search of historical national and international print media archive databases to discover reports of vessel strikes globally, although with a focus on Australian waters. A significant number of previously unrecorded reports of vessel strikes were found for both Australia (76) and worldwide (140), resulting in a revised estimate of ~15% of global vessel strikes occurring in Australian waters. This detailed collation and analysis of vessel strike data in an Australian context has contributed to our knowledge of the worldwide occurrence of vessel strikes and challenges the notion that vessel strikes were historically rare in Australia relative to the rest of the world. The work highlights the need to examine historical records to provide context around current anthropogenic threats to marine fauna and demonstrates the importance of formalized reporting structures for effective collation of vessel strike reports. This paper examines the issues and biases in analysis of vessel strike data in general that would apply to any jurisdiction. Using the Australian data as an example we look at what information can be inferred from historical data and the dangers of inference without consideration of the reporting biases. The occurrence of vessel strikes to whales is among the greatest threats and cause of anthropogenic mortality to whale populations globally. This is a result of the co-occurrence of vessels and whales in “high risk areas,” whereby there are either high volumes of shipping (i.e., shipping lanes or port areas) or conversely high numbers of whales (i.e., known aggregation areas for feeding or breeding and areas of critical habitat) (Cates et al., 2017). Over the past 25 years, there has been continual growth in the number, size and speed of merchant ships resulting from globalization (UNCTAD, 2016), as well as subsequent recovery and population growth of several whale species following the cessation of commercial whaling (Magera et al., 2013). Consequently, there have been observable increases in the apparent rate of ship strikes to whales, particularly in areas of the Mediterranean and the United States (Cates et al., 2017). To obtain a better understanding of vessel strike and its potential impacts on cetaceans globally, the International Whaling Commission (IWC) developed a centralized database (IWC ship strike database) consisting of collated records of national and international cetacean (i.e., whales, dolphins, porpoises) vessel strike incidents (e.g., Laist et al., 2001; Félix and Van Waerebeek, 2005; Van Waerebeek et al., 2007; IWC, 2010). A strategic plan to mitigate the impacts of ship strike on cetaceans has also been developed (Cates et al., 2017) which acknowledges the need for more comprehensive and accurate reporting of ship strike incidents. Interpreting reported vessel strike data can be difficult due to a number of issues, including that many incidents are not detected and/or go unreported and that there are reporting biases related to the species of animal, spatial coverage of reports and the type of vessel involved (Laist et al., 2001; Jensen et al., 2004). This paper examines the issue of vessel strike of whales in Australian waters. Australia is geographically remote and has a strong dependence on sea-borne freight with over 98% of Australia's trade by weight carried by sea (Bureau of Infrastructure Transport and Regional Economics, 2014). Shipping in Australian waters is prevalent along the majority of the Australian coastline, with larger commercial shipping generally concentrated along the East coast, the North-west shelf of Australia and within the Great Barrier Reef (Figure 1). Figure 1. 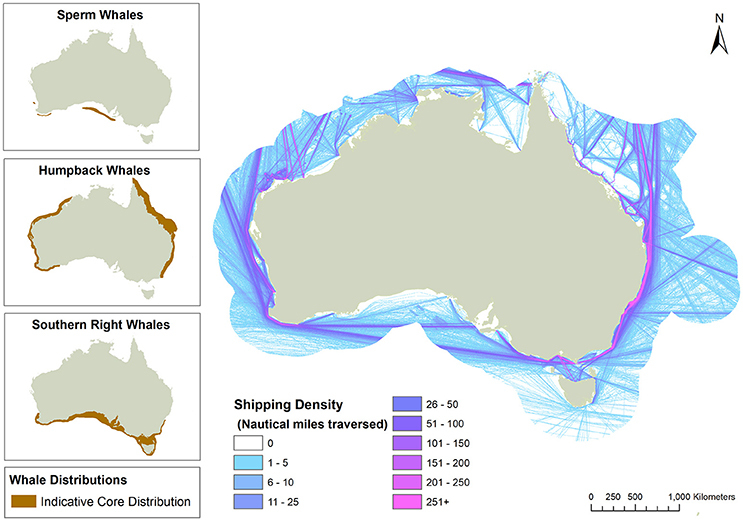 Australian 2014 shipping (>24 m length) density (nautical miles traveled in each 1 × 1 nautical mile grid cell) and humpback, southern right whale and sperm whale core locations in the Australian Economic Zone. Shipping based on AMSA AIS data. Whale distributions based on existing Department of Environment and Energy maps that are indicative only for general information based on 2011 data. In Australia, the prevalent whale species that have a distribution range overlapping with shipping (see Figure 1) and for which vessel strike records exist are predominantly humpback whale (Megaptera novaeangliae), southern right whale (Eubalaena australis) and sperm whale (Physeter macrocephalus). Both the east coast and west coast Australian humpback whale populations migrate from Antarctic feeding waters along the coastlines, generally within 20 km of the coast, primarily in waters less than 200 m in depth between May and October to breeding areas on the east (between 17 and 22°S) and west coast (12–15°S). The southern right whale is seasonally present along the Australian coast between late April and early November, principally found around the southern coastline with a core distribution range between Perth in Western Australia to Sydney in New South Wales. Sperm Whales have been recorded from all Australian states, although predominantly occur along the southern coastline of Australia off Western Australia and South Australia in waters north of 45°S and areas associated with the continental shelf (Department of the Environment, 2018). Coastal development is projected to increase along much of the Australian coastline, such as at Abbott Point in the State of Queensland, which will become one of the world's biggest coal ports (Bureau of Infrastructure Transport and Regional Economics, 2014). Recreational vessel use also occurs around most of the Australian coastline and there are projected increases in recreational powered vessels across each of the Australian states (Prideaux, 2012). Some whale species in Australian waters are showing large increases in population size, such as humpback whales (Noad et al., 2008; Jackson et al., 2015). With increasing vessel numbers and increasing whale numbers, in particular humpback whales, there is potential for significant increases in animal interaction with commercial and recreational vessel traffic in Australia. Other species, such as sperm whales, show a lack of recovery, which poses a conservation management issue (Carroll et al., 2014). Within the IWC database of whale strikes there are relatively few records pertaining to whales in Australian waters (~7% or 35 from 539 worldwide records pre-2010) (IWC, 2010). These Australian records are predominantly from the last 20 years (33 from 35 records), which corresponds to the beginning of formal reporting of vessel strike incidents by Australia via National Progress Reports to the IWC in 1997. The relatively small number of reported incidents of Australian vessel strike to whales could lead to the assumption, that historically vessel strike has been rare in Australian waters compared to worldwide. However, in terms of collation of historic vessel strike records most of the attention has been focused on the Northern Hemisphere (Jensen et al., 2004; Van Waerebeek et al., 2007) and no systematic and comprehensive collation has been done of Australian records. Van Waerebeek et al. (2007) addressed this by compiling data from the Southern Hemisphere. However, Australian records were mainly sourced from current Australian State databases, so much of the data was modern and predominantly captured in Australia's National Progress Reports to the IWC. The only examination of historical Australian vessel strike data is by Kemper (2008) who examined mainly stranding records to assess human related mortality and injury for Australian Southern right whales. An accurate record of historical incidents is essential to look at a trend in occurrence and provides a context in which to evaluate modern vessel strike records and how the rate of vessel strikes in any particular country compares to other parts of the world. However, due to differing biases associated with the reporting of vessel strikes we suggest it is problematic to derive definitive conclusions about the rate and proportion of vessel strikes relative to overall global rates (e.g., Farrell and Evershed, 2014). In this paper, we compiled a dataset of vessel strike incidents involving whales in Australian waters by searching digital media archives and other sources. Based on this new data series we present a range of analyses of the data and discuss the implicit issues with interpreting this type of data. We compiled a comprehensive database of vessel strikes to whales in Australian waters by querying a number of different sources; the IWC ship strike database, Australian National Progress Reports, Australian State strandings and mortalities databases and online historical media archives. For each incident we recorded 18 details when known (Supplementary Table 1). We searched various online archives (see Supplementary Table 2) that had both an Australian (e.g., Australian National Library) and international (e.g., Internet Archive) focus in coverage for past print media reports containing terms such as “whale strike,” “whale collision,” and “whale struck.” In this review, we have defined a vessel strike as any physical impact (i.e., including non-fatal and fatal) involving any part of a vessel (most commonly bow or propeller) and a live whale. This definition is consistent with published literature (e.g., Van Waerebeek et al., 2007) and the IWC Strategic Plan to Mitigate the Impacts of Ship Strikes on Cetacean Populations: 2017-2020 (Cates et al., 2017). We did not consider dolphins or killer whales in this review. Within the search of online media archives there were a small percentage of records (N = 5) that indicated whales actively interacted with a vessel; four incidents were reported in which whales were described to “attack” ships (see Results section) and one report of a whale colliding with a stationary vessel at anchor. Based on our definition, we have included these reports in our collation given we are interested in any whale and vessel interactions. We excluded reported collisions with vessels engaged in whaling activity, as these interactions are not likely to be typical of either modern vessel or whale behavior. There were a number of reports related to vessel strikes with racing yachts (particularly in the annual Sydney-Hobart race event that has significant media coverage) for which we only included reports where a whale was mentioned by eyewitness account, although often the whale species involved was unknown. The inability to independently verify eyewitness accounts is often a limitation that we attempted to minimize by only including accounts in which a whale was specifically mentioned or associated photographs of animals were provided. For many records, not all information relating to the 18 details (Supplementary Table 1) were included in the report, so there are incomplete details for some records. However, a majority of the newspaper and other online reports involving a ship strike reported the name of the vessel involved. Through further online ship registry (e.g., Lloyd's Register of Ships) and web searches, it was possible to populate missing information relating to vessel dimensions and type. Based on this expanded data set we then examined what inferences could be reasonably made from the data given the reporting biases. Our review of vessel strike reports involving whales in Australian waters found in total 137 reports between 1877 and 2015, the majority of which are new reports not recorded in existing vessel strike databases (see Figure 2). The IWC ship strike database (IWC, 2010) contains reports from 1840 to 2010, within which there are 35 unique records of vessel strike to whales in Australian waters, approximately 7% of the total ~471 worldwide unique records up to 2010. When we focus on the same period of time (up to 2010), 76 additional records of vessel strikes in Australian waters were identified, predominantly through online media sources and National Progress Reports (Table 1), increasing the number of Australian records to 111 or approximately 19% of the worldwide records up until 2010 (Table 2). During the process of documenting Australian records, 140 (109 were pre 1951) additional international records were incidentally identified that do not exist in the IWC database. Assuming these records are valid, a revised estimate of vessel strikes to whales within Australian waters would be approximately 15% of the updated worldwide data to 2010. Figure 2. (A) Temporal comparison of existing Australian vessel strike reports and new data. Data pooled into 2 year blocks. (B) Comparison of Australian and non-Australian records over time (based on IWC, 2010 data and our additional new worldwide records). Note that extra non-Australia records were not the focus of this study but were discovered incidentally when searching for Australian records. Table 1. Summary of the number of unique Australian vessel strike reports (+ denotes extra reports where the witness identifies collision as “possible whale,” bold entries correspond the numbers used in the approximate comparison between Australia and world totals). Table 2. Summary of the number of unique worldwide vessel strike reports (+ denotes extra reports where the witness identifies collision as “possible whale,” bold entries correspond the numbers used in the approximate comparison between Australia and world totals). Of the online media reports, only 5 of the Australian records had to be discarded due to whales not being mentioned specifically by witnesses, one record involving a capsized vessel was later discredited by police as more likely a large wave. The remaining 4 records all involved large racing yachts where the object collided with was not identified, these could potentially have been humpback whales or sunfish. After compiling the comprehensive Australian data series we looked at what information can be inferred from this data. However, when examining vessel strike data careful attention needs to be given to data reporting biases. The compiled Australian vessel strike data series results in two main disparate datasets, demarcated in 1997 with the advent of Australia formally reporting to the IWC through National Progress Reports. Hence, for the purposes of this review of the Australian data, reports from 1997 onwards are referred to as modern data and historic data corresponds to reports pre-1997. The historic dataset is mainly based on reports in print media, whereas the modern data generally consists of more direct reporting of incidents from Government agencies and researchers (i.e., IWC data collection via National Progress Reports). Due to this distinction in the source of the information between the historic and modern data, there are differences in the underlying quality and accuracy of information. Historical print media reports mainly consist of actual witnessed collisions (see Supplementary Table 3), whereas the modern data (see Supplementary Table 4) has a large proportion of strandings data (Figure 3A) with injuries suggestive of a vessel strike (i.e., propeller wounds). 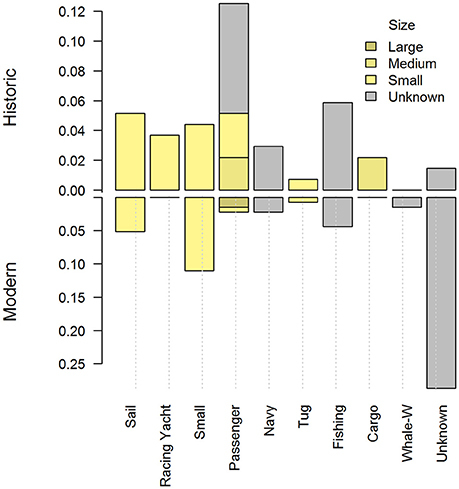 Consequently, the historic data typically consists of reports in which the species is often unknown (~85%) (Figure 3B) although vessel is known (~96%) (Figure 3C), and the modern data comprises a much lower proportion of reports of unidentified species (~23%) but a lower proportion of reports where the vessel involved is known (~53%). Figure 3. (A) Proportion of Australian reported vessel strikes that came from observed collisions (light green) or discovered bodies (dark green) in each 5-year block, with hatched gray indicating no recorded reports. (B) Proportion of Australian vessel strike reports with known species. Based on 5-year block, with hatched gray indicating no recorded reports. (C) Proportion of Australian vessel strike reports with known vessel. Vessel strike incidents worldwide are considered “rare” before 1951, with only 14 records reported by Laist et al. (2001) and only 18 records in the IWC database (Figure 2). Laist et al. (2001)'s data compilation contributed to many of the pre-1951 records in the IWC database, although their compilation did not have access to current online digital archives and considered only motorized vessels, excluded sailing yachts due to a lack of evidence these vessels caused significant injuries to whales. Ritter (2012) subsequently investigated the risk of sailing yachts to whales and found whale fatalities can occur from such collisions. Our search of online print media archives resulted in potentially 109 Australian and international vessel strike reports pre-1951 that have not been reported, which challenges the notion that the incidence pre-1951 of vessel strikes to whales worldwide were rare. In the current review, a limitation in the historical dataset is that the Australian online media archive databases (e.g., TROVE) predominantly covered up until 1954 due to copyright law (Figure 4). Laist et al. (2001) found very few vessel strike incidents worldwide pre-1951, and a large increase in incidents from 1951, as is evident in the existing worldwide data (Figure 2). Laist et al. (2001) attribute this to increases in vessel numbers, speed and size. In the Australian data, there were only 17 records for the period between 1951 and 1997 which arose due to the reduced coverage of the newspaper archive, TROVE, and some general web searches. The reduced availability of media archive coverage could account for the lack of increased vessel strike reports in Australia compared to the increasing pattern in worldwide data found by Laist et al. (2001), and it is likely that the reporting rate for this period is negatively biased until National Progress Reports were introduced in 1997 (Figure 4). Another plausible explanation is that there was a real decrease in vessel strikes around the 1950's and 1960's due to the extreme depletion of Australian whale populations from commercial whaling. For example, if we compare the Australian humpback whales' estimated population trajectory (Jackson et al., 2015) and changes in the worldwide fleet size of commercial shipping (Endresen et al., 2007), we would expect, as seen more generally in Laist et al. (2001), the rate of vessel collisions involving humpback whales to increase with increasing whale population size, commercial vessel traffic and vessel speed (Figure 5). Figure 4. A comparison of search effort and number of vessel strike reports. Search effort in terms of the number of digitized newspaper articles searched in data bases and IWC National Progress Report timing relative (colored blocks) to the number of Australian vessel strike data points per 2 years (green line). Figure 5. General estimated population trajectory for Australian humpback whales compared to worldwide commercial ship numbers. 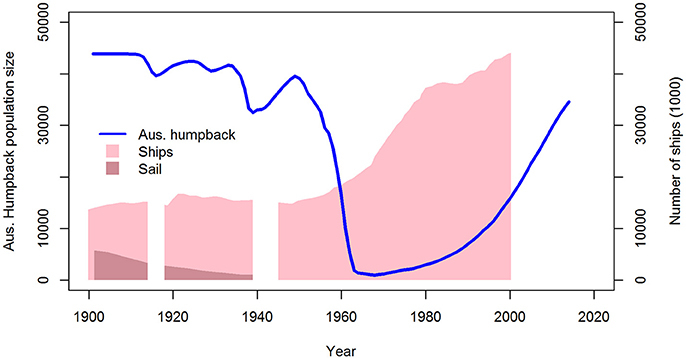 Humpback population given as blue line data from Jackson et al. (2015), vessel numbers (shown in pink) based on Lloyd's Register of Ships (Endresen et al., 2007). In the modern Australian data, there was a distinct increase in Australian vessel strike reports in 1998 (Figure 2) with an increase in magnitude of four times the reported rate (See Table 1). As outlined previously, this coincides with the start of vessel strike reports within the National Progress Reports to the IWC, but this also would indicate that there was potentially substantial under-reporting prior to this time. Reports of vessel strikes were distributed around the entire Australian coastline, except for the Northern coast (Figure 6) that has relatively lower population density, less vessel traffic and fewer species of large whales than other parts of Australia (Figure 1). The East coast of Australia is the highest populated coastline within Australia which is reflected in the higher reporting rate, particularly in the modern data (Figure 6). Figure 6. 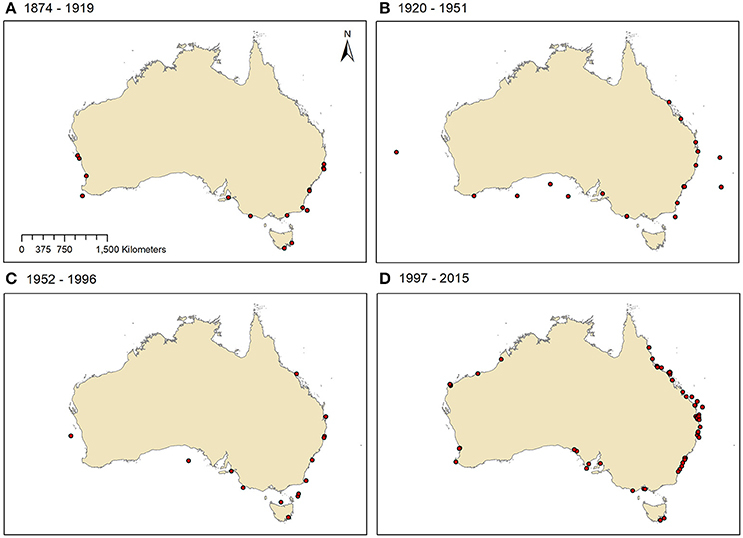 Approximate locations of reported vessel strike collisions and strandings, by period for Australia: (A) 1874–1919; (B) 1920–1951; (C) 1952–1996; and (D) 1997–2015. The species of whales worldwide predominantly involved in vessel strikes are fin whales, followed by humpback, Northern right (Eubalaena glacialis), gray (Eschrichtius robustus), minke (Balaenoptera acutorostrata), sperm (Physeter macrocephalus), Southern right and blue whales (Balaenoptera musculus) (Jensen et al., 2004). Van Waerebeek et al. (2007) found many of the same species were involved in vessel strikes in the Southern Hemisphere, with reports involving Southern right (56 reports), humpback (15), Bryde's (Balaenoptera edeni) (13), sperm (8), blue (5), sei (Balaenoptera borealis) (4) and fin whales (2). Our compiled database contained many, although not all, of the same reports from the modern data period as Van Waerebeek et al. (2007), although considerably more historic reports. In the vessel strike records involving known species, the majority involved humpback (59%), Southern right (14%), and sperm whales (8%) (Figure 7). 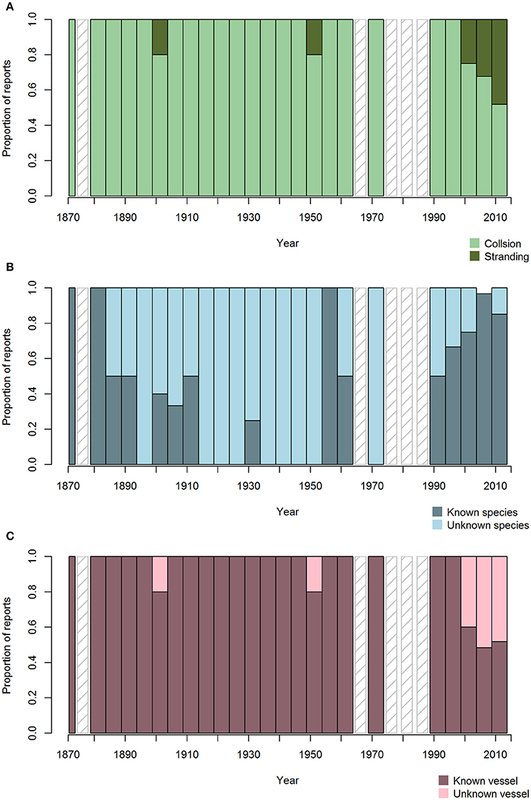 Common to both the worldwide and Australian data is a large proportion of records involving unknown species. 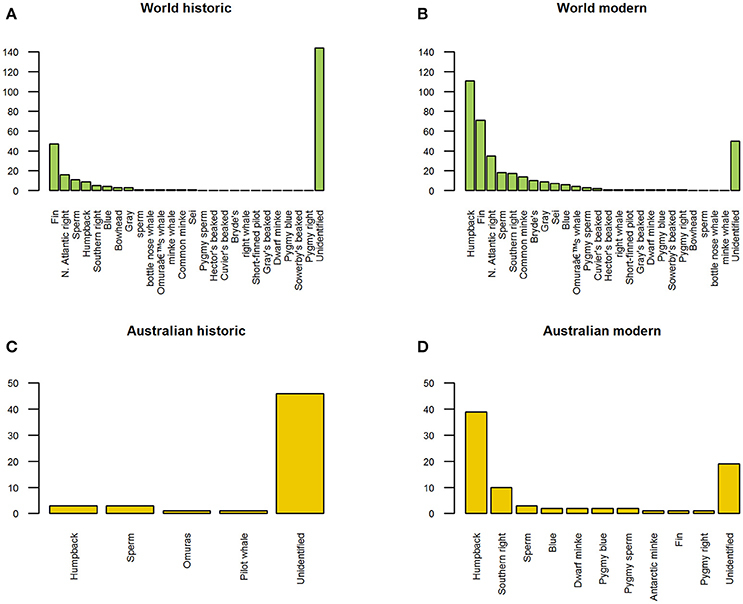 For the modern data, the most common species and their relative order are similar between the Australian and worldwide data with the notable exception of fin whales. Van Waerebeek et al. (2007) also observed this lack of fin whales in their Southern Hemisphere data. Figure 7. 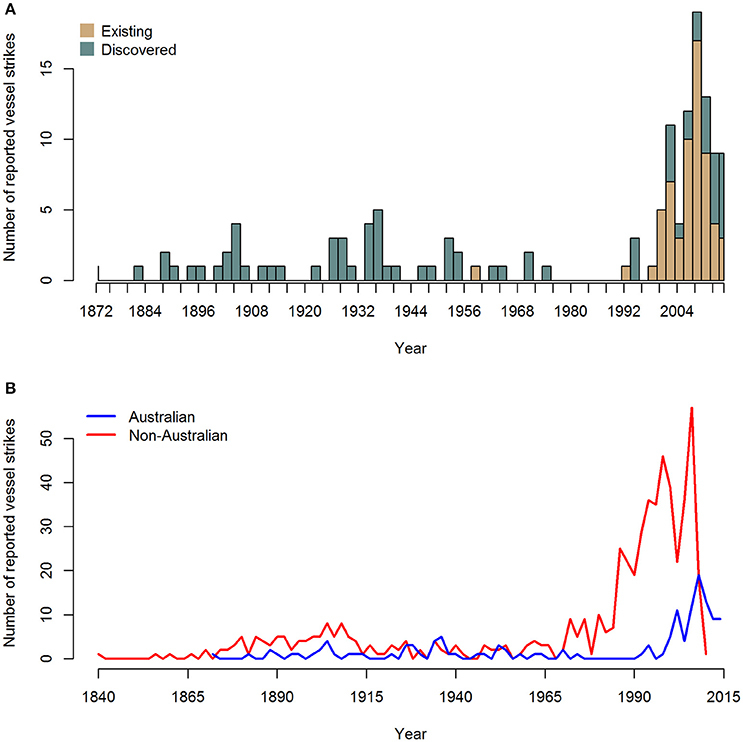 Comparison of vessel strike records by species for: (A) Worldwide historic (up to 1997) (B) Worldwide modern (1997 onwards) from IWC (2010) and potential new records (C) Australian historic and (D) Australian modern. 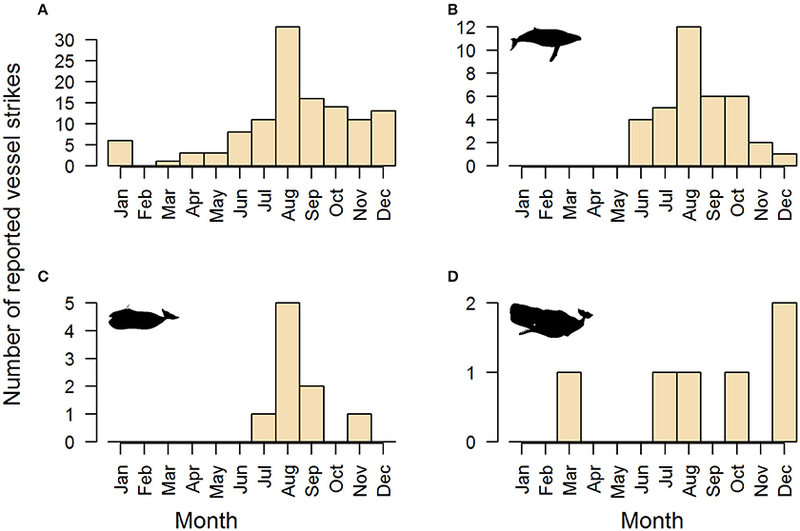 The timing of reported incidents within the year matches the migratory patterns of the species of whale commonly involved in vessel strikes (Figure 8). For example, reports of vessel strike for Southern right and humpback whales peak in August, corresponding to when these species are migrating and/or have reached their mating/calving grounds close to the Australian coastline and are consequently at their highest densities. Figure 8. Within season timing of Australian vessel strike reports: (A) all whales; (B) humpback whales; (C) Southern right whales; and (D) sperm whales. (image credit: http://phylopic.org/). Reports of vessel strike to whales in Australian waters is consistent with worldwide reports (Jensen et al., 2004) in terms of the vessel types and sizes involved, although the proportion of the vessel types and sizes differ (Figure 9). Worldwide reports of vessel strikes predominantly involves large vessels (e.g., cargo and cruise ships) with Navy vessels accounting for the greatest percentage of incidents, which is largely a factor of a high standard of military and government reporting practice (Jensen et al., 2004). While the vessel types and sizes can provide information on the vessels involved in ship strikes to whales, these numbers often reflect the reporting rate from these types of vessels as a requirement of legislative mandate which can vary among countries. For Australia, the historic data reveals a clear increase in vessel length from 1877 to 1941 that were largely passenger vessels (Figure 10A). This contrasts the modern data in which there are predominantly small vessels less than 30 m in length or unknown size. There is only one report of a large modern cargo vessel involved in a ship strike which was in 1992 when the ship came into port with a whale draped over the bow, despite commercial vessels increasing in size over time. As modern large vessels have increased in size, the likelihood that a collision will go undetected has also increased. Figure 9. Distribution of vessel types involved in Australian vessel strikes (as proportion of total), divided into approximate sizes: small (~ <25 m), medium (~25–150 m) and large (>150 m). Historic pre-1997 (upper) and modern 1997 onwards (lower). Figure 10. From the Australian vessel strike data: (A) Distribution of known vessel lengths binned into 10-year periods. (B) Box plot comparison of the distribution of length for vessels where the collision was felt to those where it was not. (C) Modeled probability of vessel strike being felt vs. vessel length (vertical gray dotted lines = data, i.e., known length and information on if the collision was felt). The historical reports from Australia show sailing vessels were the second highest reported vessel type involved in vessel strike to whales (Figure 9), supporting the assertion by Ritter (2012) that sailing vessels do contribute to vessel strikes to whales and contrasting the believed lack of evidence that sail vessels caused significant injuries to whales by Laist et al. (2001). An example is the sailing ship the Barrossa in 1903 that reportedly cut a whale in two and dented a plate in the bow of the vessel. A large number of the modern reports were from sailing yachts in an annual Australian yacht race, although increased media coverage of the international race event is likely to confound the high prevalence of this vessel type in reports. Navy vessels also constituted a number of reports of vessel strikes with whales similar to findings by Jensen et al. (2004), with a greater proportion in the historical records. These occurrences have sometimes involved submarines, although as mentioned previously are most likely due to the military and government standards for reporting such occurrences. Of the total 137 reports, it was possible in 92 cases (67%) to assess the fate of the whale resulting from the collision. In over half of the cases with known outcome the injury to the whale was reported as fatal (53%) or likely fatal, 22% of these reports the whale was noted as injured or likely to be injured, and 25% the whale was reported as unharmed. A caveat for inferences from this data are that there are limitations to the real knowledge of the outcome of the vessel strike to the whale. Observations and assessments of the whales can be brief at the time of the collision, surface observations of whales may not detect internal injuries to whales and it is extremely difficult to determine the fate of injured whales in the medium to long term. As to be expected there were no reported whale fatalities for smaller vessels, with reported fatalities often occurring due to propeller interaction on larger vessels. However, this is likely related to how obvious death is to observers (i.e., bloody water making the whale easier to find and the lethality of extreme laceration being easier to judge by observation than fatal internal blunt trauma). The outcome of a vessel strike with a whale is not always just potential injury to the whale but can also result in loss of human life or damage to vessels. Up until 2015, the Australian data included 2 reports (1.5% of all reports) of human fatalities arising from collisions with whales, 8 (5.8%) records of collisions resulting in vessels either capsizing, sinking and/or being abandoned, 3 (2.2%) records of vessels having to return to port and be slipped and 20 (14.6%) vessels being badly damaged. Many vessel strike reports contained information regarding if the collision with the whale was seen or felt by witnesses on the vessel. As to be expected, the collisions were more likely to be noticed or felt on smaller vessels than on larger vessels (Figure 10A). Some of the larger vessels historically felt the collision not from impact but entanglement with the propeller. 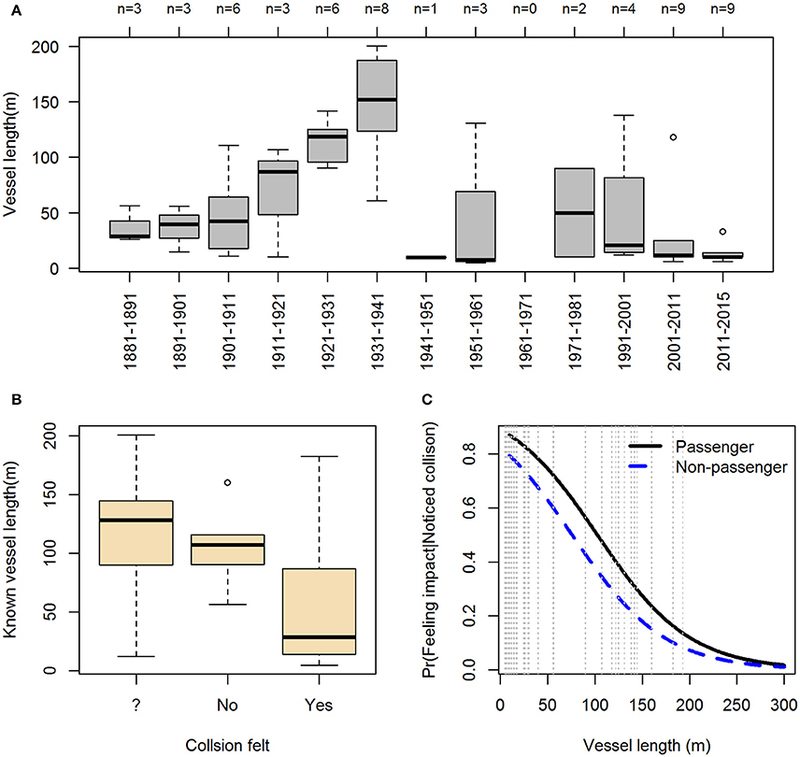 The relationship between reported impacts from collision with whales being felt vs. the size of the vessel and presence of passengers was explored further by fitting a binomial GLM to the data (Figure 10B). These probabilities are conditional on the collision being reported and therefore will be an over-estimate of the actual probability of detection. For example, if larger vessels are less likely to visually notice and/or report collisions then the probability curve for detection at longer vessel lengths would be much lower than indicated. The analysis does not estimate the overall probability of feeling a strike (as there is no data on collisions that were not noticed and hence not felt or seen). Essentially, it is the probability a collision with a whale was felt, given it was noticed, that is being estimated. The analysis showed that the probability of feeling a strike decreased as vessel size increased, with non-passenger vessels having the lowest relative probability across all vessel sizes (see Figure 10B). This is logical given passenger vessels would carry more people and hence would be more likely to detect a collision either visually, or from feeling the impact on the vessel. Our search of accessible online print media archives, stranding data and State and Federal government mortality databases has resulted in the addition of a significant number of new Australian (74 reports) and international (145 reports) incidents of vessel strikes to whales that are not in currently existing vessel strike databases. A caveat of the data in this review is that while there was significant effort to capture most of the publically accessible records, it is difficult to capture everything and additional records inevitably exist. Nevertheless, the new information highlights the need to examine historical records to provide context, better inform management surrounding current anthropogenic threats to marine fauna and better evaluate the magnitude of the risk. It also demonstrates the importance of formalized reporting structures, in this case National Progress Reports to the IWC, for effective capture and collation of vessel strike reports essential for the proper evaluation of threats to wildlife. Gathering information regarding vessel strikes to whales is problematic considering the reporting biases related to the species of animal, spatial coverage of reports and the type of vessels involved, with many incidents involving large vessels potentially remaining undetected. Understanding the biases in the data is critical for making valid inference from it. The fundamental issue with all vessel strike data is around sampling effort/bias. That is the number of reported incidents is known but the number of incidents that go undetected and/or unreported is unknown. Furthermore, the rate of detection/reporting will generally not be homogenous across the data. We now summarize the main sources of heterogeneity in reporting/detection and examples of possible causes. Annoyingly these bias issues align with aspects of the data that would make useful informative comparisons (i.e., species, vessel type, location, and temporal changes). Particularly for reports based on strandings and where uncertainty about the actual location of the collision exist, there will be potential spatial biases in detection/reporting rates. For example, the occurrence of the bodies of marine fauna involved in ship strike washing ashore may be dependent on currents, water depth and wind and will vary spatially. Coastlines with accessible beaches may have a higher chance of detection of washed up bodies than inaccessible or remote coasts and detection will be correlated to human population density. With regard to vessel strike rates of different species there are possible sources of bias. For example: It is known that the carcasses of different species have a range of flotation properties. (e.g., right whales are known to float) so may be more likely to wash up; species that have higher density in areas with lower probability of a body washing up due to oceanography etc. will have lower reporting rates; and as much of the data is collected from non-expert witness accounts, it is possible eyewitnesses will simply provide the most well-known species due to lack of witness expertise. When comparing vessel strike rates for different vessel types, some caution needs to be taken given some types of vessels may be more likely to detect and/or report collisions. For example, official vessels such as police, fishery agencies, research or whale watching vessels. There may also have been a shift in reporting bias over time due to society's changing attitudes to whales and the environment and the change from collision being exciting and interesting to modern times where witness's may have a perception of possible punishment or the potential for it to instigate future vessel management/restrictions. It seems reasonable that vessel types with more crew/passengers may have a higher detection/reporting rate. Félix and Van Waerebeek (2005) suggest large modern vessels may not notice/detect collisions with whales, which could be a result of increased vessel size and levels of automation and reduced crew size for modern vessels. Results from the exploratory analysis of the probability of feeling a strike given a collision was detected, gave the indication that larger non-passenger vessels had a much lower probability of feeling any impact from a strike. Worldwide reports (including one Australian report) involving ship strike of whales by large vessels have often arose from whale bodies draped over the bulbous bow of the vessel which has only been noticed/detected when the vessel enters a port. It would be useful to be able to look at temporal trends in vessel strike. However, this can be problematic due to changes in reporting rate over time rather than the actual rate of incidents. This can arise if there are changes in the reporting system/effort such as the instigation of formal reporting mechanisms or public awareness campaigns. Also when the data is historical and collected from sources such as newspaper archives the coverage and extent of the archive can greatly affect the number of records found over time. An analysis of the Australian data revealed a demarcation in the reporting rate of vessel strikes to whales and significant increase in the number of reports at the advent of a formal reporting structure via National Progress Reports to the IWC. It is likely this formal reporting structure was responsible for the increase in reporting rates in the modern data and the observed increase in the number of vessel strike records. This highlights the importance of having a requirement for formal, and ideally mandatory, reporting which will enable a more accurate assessment of the magnitude of the issue. It is also possible that due to the historic data predominantly consisting of media reports, not all media coverage may be available to current online search engines/databases. This would underestimate the incidents of vessel strike to whales leading up to the modern data, which is evident in the low number of reports between 1950 and 1997 that is most likely due to diminished coverage in the print media databases due to copyright law. However, this is possibly confounded by a reasonable expectation that as whale populations globally were severely depleted during the 1950's and even up until the 1970's due to commercial whaling, there would not be an increase in vessel strikes due to the low numbers of whales. As whale populations recover in number, such as humpback whales, there could be an expected increase in the reported rates of vessel strikes given significant increases in global fleet size, length and average speed and the increased probability between whales and vessels. Given projected increases in both commercial (Commonwealth of Australia, 2014) and recreation vessels in Australian waters, the recovery (e.g., humpback whales) and lack of recovery (e.g., sperm whales) of whale species from commercial whaling and their proximity to shipping routes and coastal recreational vessels, it is likely that vessel strike to whales will be an emerging issue (Laist et al., 2001). A clear pattern between the historic and modern data was that historic reports typically did not contain an identification of the species of whale involved and did provide identification of the vessel, and conversely for the modern data. If we focus on the modern data, the most common species of whale involved in Australian vessel strikes are humpbacks which is consistent with the worldwide data, followed by right and then sperm whales (Figure 8). As detailed in Table 2 there is potential bias for eyewitnesses to report species such as humpback and southern right whale as they are probably the most well-known species in Australia rather than the actual species due to lack of witness expertise. However, humpback whales are fairly abundant and recovering strongly and Southern right whales also appear to be recovering. Both have a coastal distribution during periods of their migration and on their breeding grounds, which would increase their probability of encountering vessels and is one the reasons humpback whales are a primary target of whale watching operations. Furthermore, their coastal migration increases the probability that dead bodies from a vessel strike would come ashore. Sperm whales are the other most common species involved in vessel strikes, although unlike humpback and Southern right whales there is a lack of evidence that the Australian population is recovering from commercial whaling. Consequently, vessel strikes could be an issue for sperm whales from a population recovery point of view whereas for humpback and Southern right whales it more likely a welfare issue. Fin whales are distinctly less common in Australian vessel strike reports with only one report. This concurs with data for the broader Southern Hemisphere (Van Waerebeek et al., 2007). In contrast, Fin whales are the second most common species involved in vessel strike reports worldwide (mainly driven by data in the Northern hemisphere). The reason for this is not clear, except that fin whales were heavily exploited by industrial whaling in the Southern Ocean and current population estimates indicates low numbers with a slow recovery rate (Jensen et al., 2004). It is also possible there is greater overlap in the Northern Hemisphere between whale feeding areas and shipping traffic compared to the Southern Hemisphere. In Australia waters, there has been confirmed sightings of fin whales in all state coastal waters except in the Northern Territory and New South Wales. However, available information suggests that fin whales are more commonly present in deeper waters away from Australian shipping lanes. The most striking pattern in the records of whale vessel strikes in Australia is the gradual increase in the length of vessel involved (particularly from 1880 to 1941) and the predominance of large vessels involved in vessel strikes in the historic data, contrasted by the modern data which predominantly consisted of small vessels with an almost absence of large vessels (Figure 10). Over time, the size and number of vessels in the international shipping fleet have increased (UNCTAD, 2016) as global trade increased and it is likely this is partly reflected in the historic data. It is also possible that historically, larger ships were more noteworthy news stories and hence more likely to be reported in the news. There would also have been significantly fewer small, fast (e.g., motorized) vessels compared to large passenger and cargo vessels, thereby comprising a smaller component of the overall shipping levels. In the modern data, it is logical that small vessels would be involved in vessel strikes given that small recreational vessel use has increased as the Australian population size increases. As stated above, however, the size and number of large vessels in the international shipping fleet have continued to increase in modern times. Given large ships are involved in vessel strikes elsewhere in the world, it would seem plausible that some vessel strikes with whales in Australia also involve large vessels. To date, there is only one reported case in the IWC database involving a large vessel and a whale in Australia waters. Despite the lack of modern vessel strike reports for these larger vessels, there is some circumstantial indications that collisions with larger vessels are still occurring and the lack of data is a detection issue. Although there is only one reported case in the IWC database involving a large vessel and a whale, there are a number of photographs of live humpback and Southern right whales in Australia with wounds consistent of propeller cuts from large vessels. Furthermore, there were a number of strandings in modern data (Figure 3) of whales with vessel strike wounds where it was not possible to determine the vessel size. Given that it would generally require a reasonably large vessel to fatally wound a large whale, it would seem to indicate that the collisions most likely involved larger vessels. Furthermore, it would seem highly likely collisions between large vessels and whales could go undetected, given since 1990 there have even been numerous incidents of large commercial vessels not noticing collisions with smaller vessels (ATSB, 1990-2014). With the advent of newspaper archives, historical data is now much more readily accessible and has proven to be important in providing context around current anthropogenic threats to marine fauna. The data suggests that the historical occurrence of vessel strikes with whales in Australia is not as rare as indicated from existing databases. Furthermore, it would also appear that worldwide pre-1951 vessel strikes were not as rare as previously thought. Given the issue of detection on large modern vessels, together with the observed increases and the sudden drop in vessel size involved in reports over time (Figure 10), we would suggest that despite the lack of reported collisions, it is likely that large ships are still likely to be involved in vessel strikes with whales in Australian waters to an unquantified extent. This paper shows that making inference from vessel strike data is difficult due to the reporting biases and draws attention to the caveats that need to be considered when making inference. However, despite these issues this paper also shows that data of this type can still provide useful information to further understand the impact of vessel strike. DP, JS, and SC: Reconstruction and synthesis; DP and JS: Data discovery and collation; DP: Analysis; DP, JS, and SC: paper preparation and writing. This work was undertaken for the Marine Biodiversity Hub, a collaborative partnership supported through funding from the Australian Government's National Environmental Science Programme. This work would not have been possible without the national library TROVE system which provided easy access to a large database of historical Australian newspapers. We would like to thank: the Australian Marine Mammal Centre at the Australian Antarctic Division for their support of this work and expert advice; Mike Double for presenting this work to the IWC Human Induced Mortality subcommittee; and the subcommittee for their feedback; Natalie Kelly, Jessica Ford, Russel Leaper, Fabian Ritter and Nic Bax for suggestions and comments on the paper. Thanks also to AMSA for the AIS data and Geoff Hosack (CSIRO) for processing the AIS density maps. ATSB (1990-2014). Australian Transport Safety Bureau Transport Safety Reports; Marine Occurance Investigation: mair25, mair44, mair54, mair104, mair116, mair125, mair151, mair177, mair240, mo2008001, mo2014006. ATSB. Bureau of Infrastructure Transport and Regional Economics (2014). Containerised and Non-Containerised Trade through Australian Ports to 2032–33. Canberra, ACT. Commonwealth of Australia (2014). Trends: Infrastructure and Transport to 2030. Canberra, ACT: Department of Infrastucture and Regional Development. Department of the Environment (2018). Megaptera novaeangliae in Species Profile and Threats Database, Department of the Environment, Canberra. Available online at: http://www.environment.gov.au/sprat (Accessed January 15, 2018). Farrell, P., and Evershed, N. (2014). Revealed: Whale-Watching Boats the Greatest Collision Threat to Whales. Guardian. Available online at: https://www.theguardian.com/news/datablog/2014/jun/27/-sp-whale-watching-boats-pose-greatest-threat-to-whales. IWC (2010). 2010 Ship Strike Summary Data. Available online at: https://iwc.int/ship-strikes. Jackson, J. A., Ross-Gillespie, A., Butterworth, D., Findlay, K., Holloway, S., Robbins, J., et al. (2015). Southern Hemisphere Humpback Whale Comprehensive Assessment – A synthesis and Summary: 2005-2015. IWC SC/66a/SH3, 38 SC66aSH03. Jensen, A. S., Silber, G. K., and Calambokidis, J. (2004). Large Whale Ship Strike Database. Washington, DC: US Department of Commerce, National Oceanic and Atmospheric Administration. Kemper, C. (2008). Analysis of South Australian Museum's Cetacean Data: Distribution, Seasonal Trends and Circumstance Of'death'. Canberra, ACT: Consultancy report for Department of the Environment, Water, Heritage and the Arts (2008/05955). Prideaux, M. (2012). The Impact of Recreational Boats Around Whales and Dolphins in their Australian Habitats: A Preliminary Review for the International Fund for Animal Welfare (Revised 24th May 2012). Sydney, NSW: International Fund for Animal Welfare. Ritter, F. (2012). Collisions of sailing vessels with cetaceans worldwide: first insights into a seemingly growing problem. J. Cetacean Res. Manage. 12, 119–127. UNCTAD (2016). Review of Maritime Transport. Geneva: UNCTAD/RMT/2016. Copyright © 2018 Peel, Smith and Childerhouse. This is an open-access article distributed under the terms of the Creative Commons Attribution License (CC BY). The use, distribution or reproduction in other forums is permitted, provided the original author(s) and the copyright owner are credited and that the original publication in this journal is cited, in accordance with accepted academic practice. No use, distribution or reproduction is permitted which does not comply with these terms.